Sometimes you don’t have the right power tool for the job because you’ve never needed a random orbital sander before, or your favorite drill’s motor overheats and melts, or your neighbor “borrowed” your sawzall and never gave it back. Sometimes tools just get so old and worn-out that it’s more efficient to replace them than it is to try to repair them. Powered tools come in two varieties: electric (including cordless) or air-powered. So which is better? Air-powered (also called pneumatic) tools are powered by compressed air supplied by an air compressor. Air compressors are compact tanks that can store air in compact “pancakes” of one gallon to behemoth tanks capable of holding 500+ gallons at a time. The more compressed air you have available, the more powerful tools you can run or even run more than one tool at a time. Air runs from the compressors to the tools via a flexible hose with quick-change adapter bits for rapid tool switching. Air-powered tools are generally cheaper than electric tools and are intended to be easily and frequently replaced. Compared to electric tools, air-powered versions are lighter and smaller, but they pack the same (or often higher) amount of punch. As airflow from the compressor is adjustable, air tools can deliver more torque and RPM, enabling you to finish jobs faster and easier. Initial cost: Air compressors are not cheap. Even finding “cheap” second-hand compressors is an iffy proposition at best, even if you can find one that won’t leak. The air compressor itself: Air compressors are heavy, noisy beasts. Even the quietest compressors put out about 60 decibels of noise. Also, although the pancake 1-pounders are touted as “portable”, they still weigh 10+ pounds. Maintenance: Unless using a low-end oil-less model, an air compressor maintenance schedule will have to be followed. Hoses: Even if your air compressor is “portable”, you still have to run a hose from the compressor to your tool. Additionally, cheap air hoses are notorious for leaking. Be sure to get a good quality air hose. By contrast, electric tools are much less complicated to use. As long as the battery has some juice or the power cord is plugged in, you’re ready to rock and roll. No waiting for the compressor to fill up and having to constantly swap different air tools on the same hose. Convenience is a huge positive when it comes to electric tools. Initial cost: Electric tools are typically more expensive than their pneumatic versions. Electricity required: Obviously, you need electricity to power electric tools. Air compressors can store air in their tanks for later un-powered use, but electric tools require electricity (some at all times) in order to function. With a cordless model, having extra batteries can be a life saver. For corded models, you can extend power to where you need it with heavy-duty extension cords, but this is not always feasible or safe. Cords (corded models): Just like the hoses on air compressors, you’ll need to be mindful of where your tool’s cord is. Cords are generally not replaceable, so be careful – if you accidentally cut through a cord, you could not only ruin the tool but you could also shock yourself if it’s plugged in and receiving electricity. No interchangeability: Battery-powered tools aside, electric-powered tools are single-use. One cord, one tool. This is not always a downside, especially for tools that serve one function in one permanent area, like a drill press. That said, batteries can normally be shared among tools in the same product line of a manufacturer. 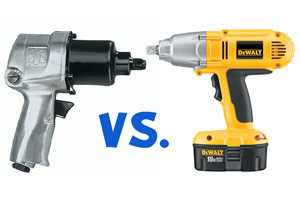 So the key is to decide on your favorite power tool manufacturer and stick with them. Professionals often use a combination of both electric and pneumatic and will switch off depending on their specific tool need and power requirements. If you’re just looking for a drill to use in your garage for one-off projects, cordless drills will do you just fine. However, if you’re looking for an interchangeable solution for, say, working on your car, an air compressor and air tools could be a good investment. As technology improves, I suspect cordless electric models will start to dominate the market for most tools but we’re not quite there yet. In the end, whether to buy the electric or air-powered version of a tool should be based on your personal use. It’s interesting how you said that the more compressed air you have the more powerful air tools you can use. I imagine that compressed air wouldn’t be too hard to come by considering that you could just buy an air compressor. Maybe I’ll have to look at buying some tools like this for my husband’s birthday. I’ll take my 18v Dewalt tools over any pneumatic. Just like cars, technology continues to improve where there’s only so much that can be done with air tools. It depends on the job you doing for some big bolts in the car you need more torque use air tool for others with less torque you can use electrical tool. Cordless electrical tools are great for portability and corded electrical tools also have their place (e.g. corded or cordless electric drills generally spin faster than their air-powered equivalents and are better for woodworking/framing), but nothing beats pneumatic tools when the job calls for them. For example, an air hammer is dead simple, having only a few moving parts (i.e. the valve that regulates airflow and the shuttle that is propelled forwards/backwards by the air), cheap ($40-300), and most are incredibly robust. All switching of airflow is controlled by air ports that are blocked off by the shuttle moving past them. To do the same with electronics would be, at a minimum, very expensive, given the need for microprocessors and switches. Such a tool, given the vibration/impact forces it is exposed to during its intended use, would also likely be unreliable. Air impact wrenches are similarly far more durable and powerful than the electric varieties. Also, air tools can also be dissassembled and rebuilt by any halfway-competent tinkerer relatively easily whereas electrical tools are almost disposable, especially battery-powered ones (what are you going to do in 5 years when you need a new battery and those are no longer made or when an internal switch shorts out?). Regarding air compressors, sure, if you want to use a tool for extended periods of time, you’re going to need a relatively large compressor, depending on the tool of course. That being said, most tools are used for brief spurts (e.g. an impact wrench is used to remove a few lugnuts, then put down), allowing the compressor to recharge between uses. For most home mechanics/DIY’ers a 20 gallon single stage compressor (~$400-600) will suffice and you can get away with an even smaller compressor if you’re willing to put up with the noise/frequent recharges (oil-less or maintenance free compressors tend to be LOUD!). Regarding maintenance, the oil in an oiled compressor can be changed by the removal of one bolt and then refilling oil through a cap and only needs to be done once every 50-200 hours of use. Water in the compressor tank causing corrosion is a bigger issue, as the compressor tank should really be drained (of air/water, which will build during use) if you aren’t going to be using it for any substantial period of time, and periodically in any case (there are ways to automate this). This can be a bit of a pain, especially for shorter jobs where the charge time of the compressor (anywhere from 3-8 minutes) and added step of draining the air tank becomes significant relative to the time spent working on the task at hand. Air tools and the air produced by them also require some attention, e.g. water separators in line to prevent moisture from being introduced into tools, tires, etc. and air tools require oiling before/after every use to prevent corrosion (storage can be a bit messy for this reason, keep the quick disconnect pointing up!). I have both types of tools and both have their pros and cons, but, for automotive and fabrication work, the air tools win almost every time for me, unless I don’t have access to compressed air or don’t want to charge up the compressor for a short job, then the battery/electric tools come out. If you want to occasionally spray paint a car part etc, then an air compressor is best. Once you have that then go to air tools, otherwise for the hobbist electric is likely all that’s necessary. If you’re with close neighbors, electric is only noisy while you use it, but w/air the tool and or the compressor is essentially on so constant nose. Cycle duty is lets say 50%, so that means run tool for 1 min then stop and let compressor rest/refill for a minute, so compressor almost always running or tool is. THAT can drive the neighbor over the edge.